Do you live near Memphis and need a comfortable new mattress? We recommend starting off by reading our reviews of the most popular mattress companies. Then, if you feel comfortable, consider an online purchase based on well established reputation and trustworthy mattress rankings. 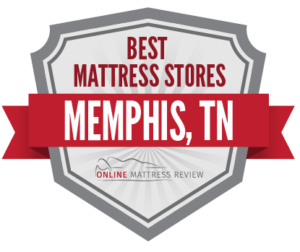 Otherwise, read through this guide to choose where to buy by using our list of the best mattress stores in Memphis. Shoppers looking to buy a mattress in Memphis are in luck. The area has an abundance of places to buy a mattress. And, while Mattress Firm, the nation’s leading mattress chain, has an undeniable presence here (with no less than ten mattress stores in Memphis), locally owned mattress shops are certainly holding their own, from furniture and mattress shops, to wholesale outlets to mom-and-pop mattress shops. Value definitely matters for customers planning to buy a mattress in Memphis. You won’t find a lot of European luxury mattress stores selling $5,000 handmade models in this city; customers here demand simple, high-quality, and affordable mattresses. Accordingly, a great number of the city’s mattress shops specialize in deep discounts and highly affordable mattresses, including factory direct and closeout inventory. If you’re resident of Memphis starting your search for a new mattress, you’ll want to know where to buy a mattress in Memphis? Rest easy- we’ve done the research so you won’t have to. Our guide to where to buy a mattress in Memphis lists the highest-reviewed options in each area off the city. Read on, and discover a mattress store that fits your preferences and budget, right in your neighborhood. There’s a lot going on in Downtown Memphis, from shopping and dining to entertainment and business. Mattress stores don’t have a big presence downtown, but there are a few places to buy a mattress in this part of Memphis. One option is Royal Furniture of Downtown Memphis (122 S Main St), which occupies a spacious corner storefront near the river. This third-generation furniture and mattress store chain has 14 locations in Tennessee and Alabama, making it the leading furniture and mattress retailer in the mid-south. This store carries Serta, Southerland, and Bedgear mattresses, as well as traditional and adjustable bases, beds and bedroom furniture. Unlike many stores that retail furniture and appliances as well as mattresses, Royal Furniture has expert staff trained to assist customers in selecting a mattress for their sleep needs and comfort preferences. Another store known for its expert staff is Mattress Firm, which has a Mattress Firm Clearance location in downtown Memphis (1556 Union Ave). Mattress Firm staff, dubbed “sleep experts” are highly-trained in understanding sleep preferences and problems, from ideal temperature and firmness for each body, to positioning that can improve sleep apnea, insomnia and back pain. Customers appreciate the staff’s expertise and no-pressure sales tactics, as well as the store’s sales policies. Mattress Firm offers a 120-day “sleep happy” guarantee. During this window of time, a mattress can be returned or exchanged, and Mattress Firm will refund the difference if a customer finds the same product at a lower price. Locally-owned Sleepy ZZZ’s Mattresses (2790 Kirby Whitten Rd) started off as just an informal mattress shop operating out of two storage units. After 15 years, this popular mattress store has built an outstanding local reputation, with a five-star Yelp rating, an A+ from the Better Business Bureau, and and a 4.9-star Google rating based on no less than 259 reviews. Customers love the store’s friendly, zero-pressure sales associates, and their low prices- 50-80% off retail. Sleepy ZZZ’s Mattresses offers even deeper discounts on discontinued models, starting at just $99 for a twin. The shop carries name-brands like Sealy and Serta, and even features a “build-your own pillow bar,” where shoppers can custom-fill pillows to their comfort preferences. Another place to buy an affordable mattress in the area is Mattress Outlet (2125 Frayser Blvd), which also sells beds, sofas and other furniture basics. This locally-owned furniture and mattress store offers low pricing and highly flexible financing options, as well as fast delivery. Shoppers looking for furniture as well as mattresses will have an abundance of options in South Memphis. Here, a number of locally-owned furniture and mattress stores sell mattresses, beds, bedroom furniture and furniture sets at very affordable prices. Hotel to Home (3981 Winchester Rd) is a family business which specializes in hotel surplus furniture and mattresses, which tend to be of high quality and gently used, at low prices. Customers report finding excellent bargains on mattresses and mattress sets. Customers appreciate the store’s affordable mattresses and bedroom sets, as well as same-day delivery. JAYS Mattress & Furniture Outlet (3254 Elvis Presley Blvd) is another furniture and mattress store that has that has earned a great reputation with local shoppers. Customers praise the store’s prices, selection, and helpful customer service. Finally, the mid-South’s leading furniture and mattress chain has two locations in East Memphis. Royal Furniture Warehouse (3374 Tranquility Dr) and Royal Furniture Whitehaven (4121 Elvis Presley Blvd) have earned 4.7-star Google ratings, with shoppers praising the store’s highly affordable mattresses and furniture sets. Sleep Station Mattress Outlet (4862 Summer Ave) has built an excellent reputation with local shoppers, who appreciate this mattress shop’s fair prices, good selection, and friendly customer service. The sales staff are known to work within each customer’s budget, and to go the extra mile to resolve problems with new mattress purchase. The store specializes in closeout and liquidation models, at up to 75% off retail, and all mattresses come with a one-year warranty. This locally-owned mattress shop also gives back to the local community by sponsoring a number of area charities and community events. Another locally-owned place to buy a mattress in Memphis to the East is Sleep Cheap Mattress (6330 Winchester Rd). This family-owned store sells highly affordable mattresses: closeouts from name brands like Serta, Sealy, Sterns and Foster, and Simmons, at up to 70% off retail, along with economy brands MLily and Sigature. Still another local option with affordable mattresses in the area is Baker Mattress (4614 Quince Rd), which sells Sealy, Serta and Simmons mattresses at wholesale prices. The store also makes high-quality custom mattresses for children, antique beds, boats and airstreams. Customers love the store’s prices, as well as free delivery and setup. There are relatively few places to buy a mattress in West Memphis. One option, however, is Chapman Furniture (341 S Main St), which has earned a 4-star rating on Yelp and a 5-star Google rating. This locally-owned furniture and mattress store is one of the city’s oldest, and, in addition to affordable mattresses, sells bedroom suites, living room suites, dining tables, lamps, recliners, and appliances. Customers appreciate the store’s selection, but give special praise to their friendly and patient customer service.